I’m sure you’ve been wondering all week about the strange ‘squiggles’ in my blog banner. Well, perhaps not, but the sleep geek in me hopes that at least one of you has. My blog banner has a segment of an electroencephalogram (EEG) or ‘brain waves’. This is a recording of my EEG, in fact. At this point in the night, I am in Stage 2 sleep. Each night when we go to sleep, we will experience non-REM sleep and REM sleep. Non-REM sleep (also written as NREM sleep) has been further categorised as Stages 1 through 4. A bit of sleep history… The concept of sleep stages was first postulated in 1937 by Loomis et al. This concept went through several iterations in the following decades. However, it was Aserinky and Kleitman’s groundbreaking discovery of REM sleep in the early 1950s that set us on the path to defining sleep as NREM sleep and REM sleep. Sleep stages as we currently know them were defined by a committee of sleep researchers, chaired by Allan Rechtschaffen and Anthony Kales in 1968. These criteria have recently been updated by an American Academy of Sleep Medicine committee (2007) to comply with our current understanding of sleep physiology. The diagram above shows a schematic hypnogram1 of sleep stages across the sleep period. A hypnogram is a graphical way of presenting changes in sleep structure. On the y-axis you will be able to see Stages 1 through 4 sleep and REM sleep. Stage 1 is the lightest stage of sleep and comprises up to 5% of the sleep period. Stages 3 and 4 are the deepest stages of sleep. These are collectively referred to as slow wave sleep2, denoting the slow frequency, high amplitude EEG seen during these stages. Our threshold for arousal is highest during slow wave sleep therefore this stage is also referred to as deep sleep. Slow wave sleep and REM sleep each comprise approximately 20% of the sleep period in a healthy young adult. The remainder of our sleep period is made up of Stage 2 sleep, or ‘light’ sleep. 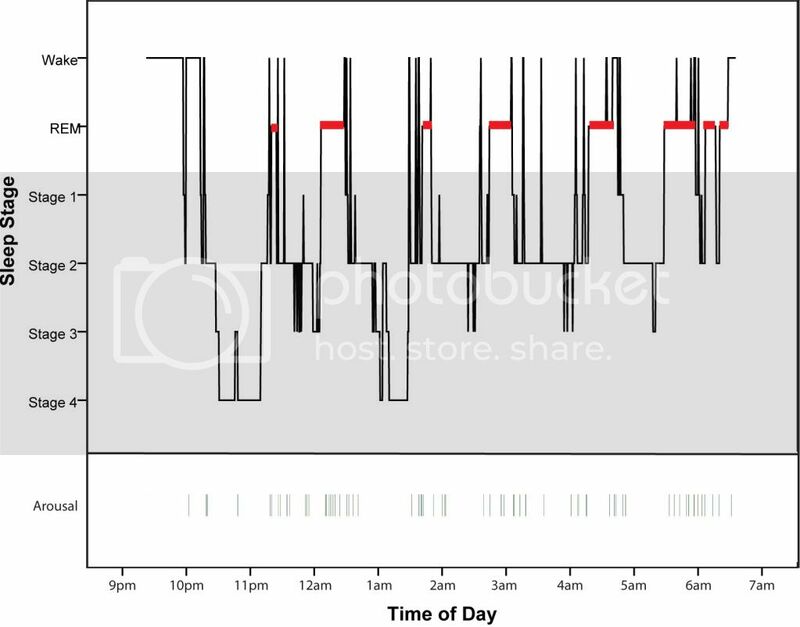 The hypnogram also depicts changes in sleep that occur across the sleep period. Slow wave sleep predominates in the first half of the night and REM sleep in the latter half. Transition through all the sleep stages are reasonably cyclical and repeat every 90 minutes, approximately. The hypnogram above is an example of real sleep in a healthy young adult. 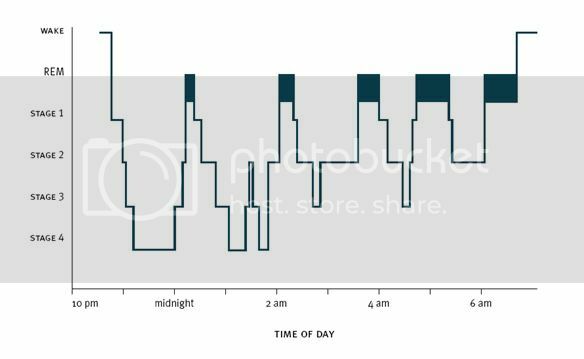 Notice the trends are similar — more slow wave sleep at the beginning of the night and more REM sleep in the latter half of the night. However, I’m sure you’ve noticed that this individual chops and changes between sleep stages all the time. This is not unique; you and I would do this each night as well. The activity in the brain is changing frequently during sleep and this is reflected in our frequently changing sleep stages. These rapid changes in brain activity also mean it is also quite normal for the brain to return to wakefulness on a frequent basis. Arousals from sleep are shown in the lowest panel in the hypnogram. One vertical line represents one brief arousal from sleep. Arousals are an expected part of normal healthy sleep; in a healthy young adult these arousals typically occur 10-15 times per hour of sleep. We are not aware of any of these brief arousals as they usually only last a matter of seconds. Does our sleep change with age? Yes. Is there such a thing as ‘too many arousals’? Yes. Why is there a difference between the number of arousals and the indication of Wake on the hypnogram? We’ll have to leave the detailed answers to these questions for another time. If you have questions, let me know in the comments section and I’ll do my best to address them in future posts. 1 Hypnogram kindly reproduced with permission from Gander, P. H. (2003). Sleep in the 24-hour society. Lower Hutt, New Zealand: Open Polytechnic of New Zealand. 2 The 2007 sleep staging criteria refer to slow wave sleep collectively. That is, Stages 3 and 4 sleep are no longer defined separately. Nice blog. When I ask my wife how she slept during the night, she often says “I dreamed a lot” and I keep telling her, that’s good, that’s REM, its what you’re supposed to do. Nice to see that I’m normal with longer REM periods from an hour or so before I wake up. Nice!!! Itâ€™s really very informative article, I really appreciate your thoughts. I obviously enjoying and I also bookmarked & will visit again in future updates. Thank you for this nice post I will visit your page again. Hi, I’m a late comer, but hope still in time. I’m trying to understand why rem sleep is put between wake and stage 1 and not below stage 4 in a hypnogram. Do you have an answer or some clues? Thanks a lot. NREM sleep and REM sleep are distinct from each other in terms of the electroencephalogram (EEG) and the underlying brain activity. Some areas of the brain that are active during wakefulness are also active during REM sleep. To denote this, REM sleep is placed above all NREM sleep stages (I suspect to highlight that it is a distinct stage of sleep).